How do I connect Klipfolio and Google AdWords? You can set up a connection between Klipfolio and your Google AdWords data to display your advertising metrics on a dashboard. What options do I have for visualizing my Google AdWords data? Google AdWords pre-built data sources: Data sources provide the foundation for Klip building, so we suggest you create a data source as a first step (before building Klips and adding them to your dashboard). Our pre-built data sources focus on the most sought-after Google AdWords data and are found on the Service Connectors page, available from this link or from your list of data sources. When you select a service connector from this page, the data source for that service is automatically added. Google AdWords pre-built Klips: Pre-built Klips enable you to quickly set up a dashboard using predefined visualizations that display common key metrics. Pre-built Klips are found in the Klip Gallery or, for White Label customers, in the Integration Gallery. Google AdWords pre-built dashboards: Pre-built dashboards provide an efficient and effective way to gather thematically-related Klips into a single, purposeful dashboard. Pre-built dashboards are found in the Dashboard Gallery. Regardless of whether you choose pre-built, custom-built, or a combination of both, before you start building Klips and dashboards you need to connect to Google Adwords data in Klipfolio. How do I connect to Google AdWords data in Klipfolio? When you connect your Google AdWords data to Klipfolio, you will be prompted to connect your Google AdWords account by entering your username and password. Doing so will create a token that enables Klipfolio to securely access your Google AdWords account. Your token looks like George@Google AdWords. You can use and reuse the same token every time you connect to Google AdWords. Note: You manage your connections (tokens) to Google AdWords in Klipfolio under Connected Accounts in the Account section. How do I add a Google AdWords pre-built data source? To use the "Client List (MCC)" pre-built data source, you require the Google Adwords My Client Center (MCC) access level. Navigate to the Service Connectors page in Klipfolio and choose Google AdWords from the list. Click Connect an Account. Enter your Google AdWords login credentials and click Next. If prompted, click Allow Access to enable Klipfolio to securely access your Google AdWords data. Click Next Step. If you chose the Account List pre-built data source in step 2, click Submit. If you chose the Client List (MCC) pre-built data source in step 2, on the Configure Data Source page, select your Google AdWords company name from the drop-down list. How do I add Google AdWords pre-built Klips? In the Klip Gallery or, for White Label customers, in the Integration Gallery you can browse individual Google AdWords pre-built Klips and add them to your dashboard. You replace the sample data that is included in pre-built Klips with your own Google AdWords data by clicking the menu in the Klip and selecting Connect your data. How do I add Google AdWords pre-built dashboards? In the Dashboard Gallery, you can browse and add pre-built Google AdWords dashboards. You replace the sample data that is included in pre-built dashboards with your own by clicking Connect Your Data at the top of the dashboard. How do I create a Google AdWords custom-built data source? Connect directly to the Google AdWords API using the Google AdWords connector and access all available Google AdWords reports to use as data sources for your Klips. Many of the AdWords reports have a large number of different fields associated with them. Fields that include extra options are referred to by Google AdWords as predicate values. Predicate values must have an operator. Examples of operators include "Equals", "Not Equals", and "Starts With". Some predicates have required operators. For example. the "Device" predicate requires either the "Equals" or "Not Equals" operators. Not every predicate value is compatible with every operator. Money type fields in AdWords reports return money values in micro currency units (also known as micros). For example, $1.23 US currency is returned as 1,230,000 micros (1.23 x 1,000,000). To convert micros to the currency used by your report, divide the number of micros by 1,000,000. Note: Options for any money fields must also be in micros. On the Pick a Data Request page, click Create a custom Google AdWords data source. Select a report template and click Select Report. For a comprehensive list of report types, see the Google AdWords Report Types documentation. 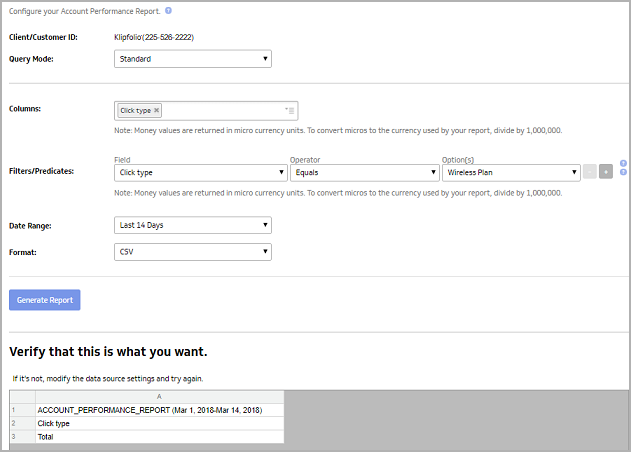 See below for an example or report configuration using the Account Performance Report. Select a Query Mode from the dropdown menu. When you select Standard, the query is automatically generated from your subsequent field selections. Custom allows you to write your own query using the AdWords Query Language (AWQL). See an example query in the reference table below. Select the Column type from an auto-generated list based on the report type you selected. Select the parameters that you want to measure from the Filters/Predicates from the dropdown menu. Every report contains a variety of parameters or fields used for collecting specific data to generate a report. Select the Date Range on which you want to filter. To add a date range to a report that does not have one, select a date type from the Columns or Filters/Predicates fields. Select the Download Format in which you want to download the data. XML and CSV formats are supported. When you are finished configuring your report, click Generate Report. If you are satisfied with the resulting data source, click Continue. How do I create a Google AdWords data source from scratch? Refer to the Google AdWords API documentation to discover more data requests. The Google AdWords connector in Klipfolio allows you to write your own query in AdWords Query Language (AWQL). For information on error messages you might receive when using Google AdWords API, go to the AdWords Common Errors page. How do I create a Google AdWords custom Klip?